My final version of this pattern is available! Here's the newest blog about it. Awesome finished blanket! A challenge at first. A FREE download at Lion Brand. Also a project of several on Ravelry. TIPS: 1) It's helpful to color code the written directions/chart to match colored in st explanations to help the low of reading the pattern while knitting. 2) It helps to use a color key to match up the stitch directions with the written directions (or chart). Worked on size 6 needles. MY CHANGES: CO 114 for seed st border and a chain edge rather than tulip . In addition to the written pattern each side has an extra 11 sts. Each row begins with slip 1 knitwise (sl1kw) then 10 seed sts and each row ends with 10 seed sts and the last st is purled. This is why I cast on 24 (11x2) more sts than the pattern calls for. EXTRA DIRECTIONS: CO 114. Knit in seed st pattern (w/ sl 1st kw, purl last) for 14 rows then knit the tree pattern as written within the extra 24 co sts. Purl 1 row (as it states). Continue following the pattern as written then after completing row 50 of the 2nd tree pattern, work 14 rows in seed st. I bound off using EZ’s sewn bind off (2.5 x the width of the blanket would be enough yarn). FLOWER GARDEN NOTE: on Row 1 it says to increase 1 in the first st. For this I worked my seed st edge then made one purlwise using the right leg of the stitch below the next st on the left needle. Then I purled into the next st (the st above the one I just m1 into... confused?) I then continued with p8, *k1b, p11* ending with k1b, p10 just before the seed st border begins. This is beautiful. I have a granddaughter on the way and would love to do this for her. It seems you did make yours more crib sized than Lion brand. Did you just leave some trees out to decrease the width and length? 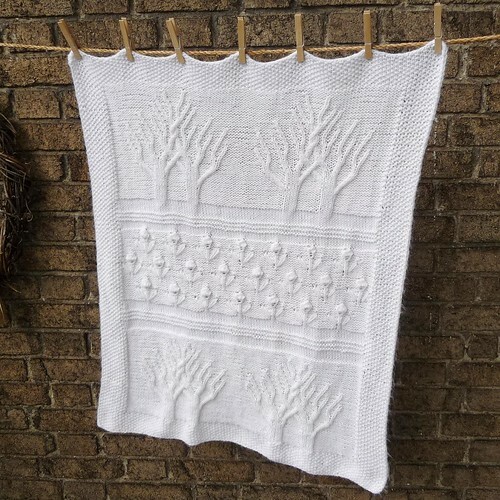 @Judy: Nope, I don't leave any trees out; I do use a size smaller needle than the LB pattern calls for because I tend to knit a bit looser and have less sts per inch so I usually go down one needle size. My version also has seed stitch border. I'm not sure how much wider the tulip stitch border would make it since I've never done it that way. How big should the "long loose loop" be? Super confusing. I don't ever knit anything using "long loose loops," just normal stitches. @Anonymous: When you pull up that loop, you want it to sit against the blanket. Pull it up as per the directions, but don't pull it tight to pucker the stitches between and you don't want it super loose where it sticks out away from the blanket. I think my loops were about 1" long from per "side" and 2" as a complete loop. I'm sure you'll get the hang of it right away and you can always undo it if your not happy.